One of the things I miss most being vegan is cheese. I have tried other plant based queso recipes and was not impressed - until this one! It really tastes like the real thing. The texture is very similar to the original. The flavor is just spot on. I served it to my family and friends who all loved it and couldn’t believe it was vegan. It is easily to prepare with ingredients you have on hand. I didn’t have any canned tomatoes, but I did have a jar of organic salsa. So I swapped 1.5 cups for the 14 oz can of tomatoes. It worked really well and I continue to make this recipe with the salsa instead of canned tomatoes. Additionally, I prefer to use foods packed in glass over cans so this swap really works for me. Creamy, sweet, nutty, decadent, this recipe has it all! Once the hazelnuts are roasted, the rest of the recipe is straightforward to make. It keeps for a few weeks in the fridge. I have used it on toast as depicted above, swirled into chia pudding and on top of oatmeal. It does become more solid once refrigerated. I first tried this recipe when I had some exchange students visiting me from Tel Aviv. They asked for Nutella and it was a perfect reason to try making it myself. I am so glad I did. This homemade version is so far superior to the mass produced, store bought hazelnut spread. I have the Oh She Glows App on my iPad which I use in my kitchen. The recipe there is slightly different as it calls for cashews in addition to hazelnuts. I have tried it both ways as I made a batch for a friend whose son is allergic to cashews. Both versions are wonderful, you really don’t notice the difference without the cashews. Additionally, the app version of this recipe suggests you add some chocolate chips at the end of the processing. I added in one handful, about 1/8 cup of vegan/stevia sweetened chocolate chips. I opted out of using the espresso as I was making this for teens. I have yet to try it with the espresso, but I’m sure it is outstanding! Simple, tasty, quick, what could be better? This recipe is terrific because there are a few basic ingredients, not much prep. Just put the seasonings together, marinate the mushrooms and bake. You don’t have to stand by a stove to watch them, so you can do other things while this dish is marinating and cooking. No tweaks needed here! However, made this with baby bella mushrooms (as pictured above) one time and it worked well, just keep them whole and use a 2” deep pan. I have made this with fresh herbs (which I prefer) and tried it once with dried herbs. It does work with both. If you are in a pinch and need to use dried herbs, cut the amount in half. This soup recipe comes from Molly Patrick of Clean Food Dirty Girl. Molly has a great philosophy about healthy eating and cooking. Clean Food, Dirty Girl is one of my favorite sites. Molly Patrick has a great sense of humor and is really down to earth about healthy eating. She doesn't nag or preach perfection. Her recipes are healthy and tasty. This soup can be prepared quickly. It is light and flavorful. I wanted the flavor to be a bit more intense so I decreased the amount of water by 1/4 cup. Additionally, I measured out the garlic, salt and pepper to get a more precise recipe. Used a bit less garlic than the 5 cloves the original recipe calls for. In the end, I added 1 tablespoon lemon juice to finish the soup. The sauce is creamy and substantial yet light at the same time. It is not overpowered by the turmeric as some vegan mac and cheese sauces are. The sauce makes enough for leftovers and lasts for up to a week in the fridge. The ingredients are basic, yet the sauce has a crave worthy flavor. I increased the amount of salt. I have also subbed white beans and cauliflower for the potato and got good results (same amount as the potato). Just recently I added one teaspoon of apple cider vinegar to the finished sauce. It added a nice tanginess which I really loved. Want the recipe? CLICK HERE. (note - scroll down the blog post for the recipe). Not only is the best tasting almond milk, it is the easiest recipe I have tried. Because you use almond butter (click here for recipe or use store bought - it works well with either) there is no straining or soaking. No need to spend lots of time squeezing a nut milk bag or waiting for almonds to soak overnight or remove peels. The flavor is so pure, you can really taste the almonds and other ingredients. After having this, I don't think I can go back to store bought almond milk with all the fillers, stabilizers and other unwanted ingredients. I have been using it to make a maca/dandelion tea latte (picture above) and chia pudding and both are so tasty it's amazing how much better it is than boxed milk! I used medjool dates instead of maple syrup because it is not as sweet and has fiber and other health benefits. I doubled the recipe because I am using it daily and need a big batch to have on hand! Note - I made it with raw almond butter (Trader Joe's) and also with organic, roasted almond butter (Costco) both worked out well and tasted great. I have tried a few non-dairy chocolate puddings before and this one is the best tasting. The recipe uses simple ingredients that you always have on hand. It is not too sweet, the coffee adds a complexity of flavor. The texture is thick and rich like old fashioned pudding. I made it with less maple syrup (about half the amount), while my friend liked it, I preferred with the full amount as listed on the recipe. 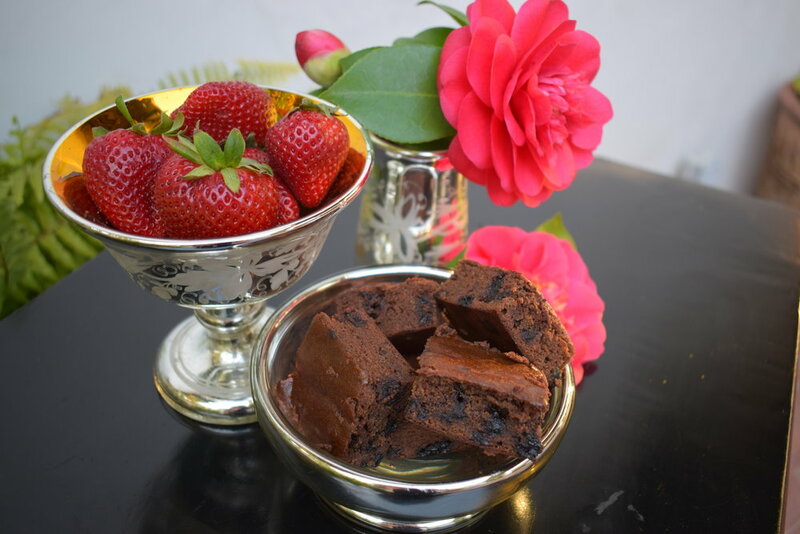 We did serve it with cut up vegan/gluten-free brownies, raspberries and cinnamon cashew cream for a real decadent treat! This is a quick and simple yogurt to prepare. It doesn't require any probiotics or other type of powder. The taste is sweet and tangy at the same time! Nothing here! But I did create a PDF so you can print it out! This was one of the first vegan sweets I tried making when I first discovered recipes designed without diary and refined sugar. I made it so many times because they are quick and easy requiring very few ingredients. They are very indulgent but the light, minty flavor takes away any heaviness you might find with a rich chocolate dessert. They are best kept and eaten frozen which gives them a nice texture as well. The recipe is actually for a peppermint patty which has two cookies, a mint filling and a chocolate coating. I tried to make them but didn't have much luck with the mint filling. So I just made a half recipe of the wafer part only. Sometimes I make the chocolate coating and sometimes I just melt down good quality, vegan chocolate chips. I also find it easier to dip half the cookie in the melted chocolate. It stays together better and I prefer it with less coating. This shake is such a treat. It is sweet from the dates, but not too sweet. It is creamy and really satisfies the desire for something decadent. The maca powder gives it a depth of flavor which makes it special almost like a date shake that you get from a date farm in Palm Springs! I am always trying to find good recipes that add in superfoods like maca so this one is a must have for the health benefits, taste and texture. Update: I have been recently cutting back on the amount of sugar (even natural sugars), so I tried this with using only one date - it was great! So you don't need to use the full amount the recipe calls for and still have a wonderful treat here. I used vanilla flavored almond milk (check the label to make sure it doesn't have many objectionable ingredients like carageenan) instead of coconut milk. You might want to soak the dates in hot water for 10 minutes if they are dry so they break up and incorporate into the drink. Going to the store, The Spice Way LA is a real treat. It is beautiful and has every spice you can imagine beautifully displayed. There are so many varieties of tea, you can even make your own custom blend. I like this one because it is so unique, the flavors are perfect together. When I saw the name for this recipe, The Life-Changing Loaf of Bread, I knew I just had to try it. I find it is more like a nut loaf than bread. It is best sliced and toasted. It comes from the beautiful site My New Roots. The prep is straightforward. You combine the ingredients, allow to sit for a while, then bake. I used 1/4 cup ground flax instead of 1/2 cup whole flax seeds. Used almonds instead of hazelnuts and roughly chopped them.